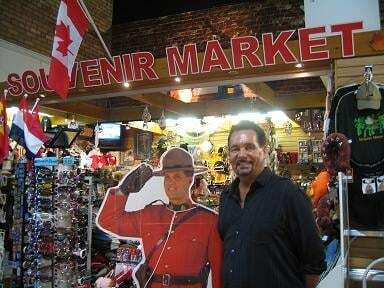 April 2012-National Geographic Magazine names St Lawrence Market Best Market in the World! This unique 90 minute tour includes a guided walk with Bruce Bell through Toronto's famed St Lawrence Market hearing about its fascinating 200 year history. Then after covering the Market we’ll go walk around Old Town Toronto including stops at: St Lawrence Hall, King Edward Hotel (when available), as well as various historical sites along the way. 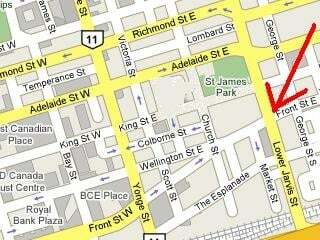 St Lawrence Market is located at 91 Front Street East on the southwest corner of Jarvis and Front Streets, two blocks east of Yonge Street and is wheelchair accessible. 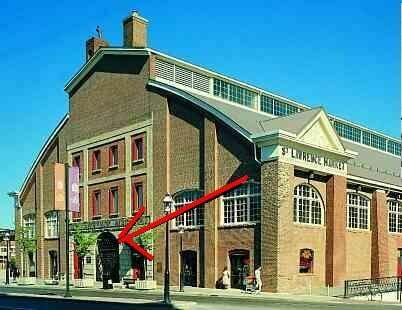 MEETING PLACE: As soon as you enter the main Front Street centre archway of South St Lawrence Market (see photo directly below) there is a Souvenir Shop on the left hand side where there is a life-size cardboard cut-out of a Canadian Mountie, I will meet you there. I will have my phone if you need to get hold of me.